In THE GLOB WHO GIRDLED GRANVILLE & THE SECRET LIVES OF ACTORS, we encounter perhaps the two biggest icons of '50s B Horror, The Blob and The Thing from Another World . This time around, we meet our monsters decades after the films that made them famous as they attempt to adjust to "normal life." Whether you've seen the movies or not, Grandbois' madcap prose breathes life into these monsters, and, in doing so, makes us better able to face the monster in ourselves. ​"Extraordinary characters in ordinary situations prompt wry philosophical speculations about everyday life and longings in this pair of novellas laced with tropes from sci-fi B movies...Although Grandbois (Domestic Disturbances) endows his characters with some otherworldly attributes, he renders them believably human through their self-doubts and amusing foibles. His clever, sympathetic depiction of the men inside the monsters will appeal to a wide range of readers." "If you ever doubted that monsters (and movie stars) have rich inner lives, doubt no more. Let Peter Grandbois be your guide to the wounded heart (or some extra-terrestrial equivalent) of every alien being on a rampage. Full of wit, verve, and imagination." 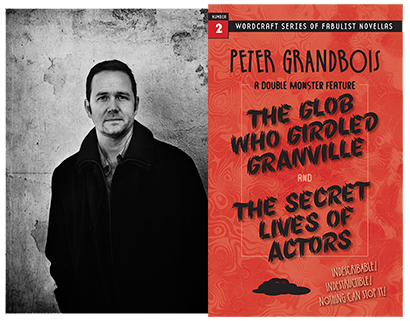 "The monsters Peter Grandbois gives us here aren't just painfully wonderfully human, they're each of us, they're all of us. After reading this, you'll see that you've had scales all along." Lit Reactor Review "A must read..." --Chris Rosales Read here. HTML Giant Review "Grandbois . . . breath(es) a new, complex literary life into both narratives, so that the thrill is one of uncanny insight and surprising tenderness. . .a haunting critique of domesticity and divorce—not the conventional manifestations of these states, but their ungraspable and inevitably reductive power. . . exposing the underlying importance of the freakish clinquant that is our need for our own pop history. . ."
​-- Nate Liederebach Read here. Peter Grandbois' first novel, The Gravedigger, is currently in pre-production as a major motion picture. It was also chosen by Barnes and Noble for the "Discover Great New Writers" program and named one of the best books of 2006 by Booklist. His second novel, Nahoonkara was ForeWord magazine's Book of the Year Award winner in literary fiction for 2011. He is also the author of an innovative memoir entitled The Arsenic Lobster and a collection of surreal short fictions, Domestic Disturbances, currently a finalist for ForeWord magazine's Book of the Year Awards. His plays have been produced in St. Louis, Columbus, and on 42nd St. in New York. He is a professor of creative writing at Dennison University in Ohio.